3pk Oregon Xtended Mulching Blade Bush Hog RDTH 84 HDTH7 Finish Mowers 50033779. Set of 3 Oregon Xtended Mulching Blade Replaces OEM Part Numbers: Bush Hog 50033779. 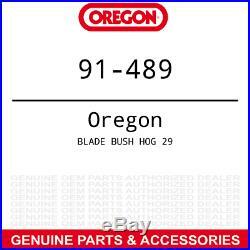 Genuine Oregon Product Replaces OEM Part Numbers: Bush Hog 50033779. Fits: Bush Hog 29, RDTH 84, HDTH7, and HDTH8 Rotary Finish Mowers. Requires 3 blades 84 decks. X-Tended Cutting Length optimizes the cutting efficiency with each revolution. The item "3pk Oregon Xtended Mulching Blade Bush Hog RDTH 84 HDTH7 Finish Mowers 50033779" is in sale since Thursday, March 21, 2019. This item is in the category "Home & Garden\Yard, Garden & Outdoor Living\Lawn Mowers\Lawn Mower Parts & Accessories". The seller is "fix_my_toys" and is located in New Baltimore, Michigan. This item can be shipped to United States, Canada, United Kingdom, Denmark, Romania, Slovakia, Bulgaria, Czech republic, Finland, Hungary, Latvia, Lithuania, Malta, Estonia, Australia, Greece, Portugal, Cyprus, Slovenia, Japan, China, Sweden, South Korea, Indonesia, Taiwan, South africa, Thailand, Belgium, France, Hong Kong, Ireland, Netherlands, Poland, Spain, Italy, Germany, Austria, Bahamas, Israel, Mexico, New Zealand, Philippines, Singapore, Switzerland, Norway, Saudi arabia, Ukraine, United arab emirates, Qatar, Kuwait, Bahrain, Croatia, Malaysia, Brazil, Chile, Colombia, Costa rica, Dominican republic, Panama, Trinidad and tobago, Guatemala, El salvador, Honduras, Jamaica, Antigua and barbuda, Aruba, Belize, Dominica, Grenada, Saint kitts and nevis, Saint lucia, Montserrat, Turks and caicos islands, Barbados, Bangladesh, Bermuda, Brunei darussalam, Bolivia, Ecuador, Egypt, French guiana, Guernsey, Gibraltar, Guadeloupe, Iceland, Jersey, Jordan, Cambodia, Cayman islands, Liechtenstein, Sri lanka, Luxembourg, Monaco, Macao, Martinique, Maldives, Nicaragua, Oman, Peru, Pakistan, Paraguay, Reunion, Viet nam, Uruguay.